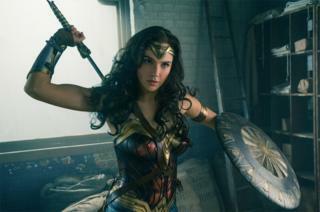 As Wonder Woman, Gal Gadot can do anything - apart from getting people to pronounce her name correctly. You've probably been calling her Gal Gah-dote or Gal Gah-doh all this time. Or maybe you're not at all sure and have been mumbling her surname, hoping no one will notice. But the Israeli actress recently cleared up the confusion by telling Jimmy Kimmel it's actually pronounced Gal Gad-dott. She's not the only one who's struggled with name issues. Here are a few other famous faces whose name you may have been saying wrong. Twenty years ago, no one had heard of Harry Potter author JK Rowling. But with great fame comes great name mispronunciation. Is it Roe-ling or Rowl-ling? The author once corrected an interviewer saying: "It's Rolling - as in Stone." Mamma Mia! star Amanda Seyfried is constantly correcting people on how to say her name. Sieg-freed, Sigh-freed, Sieg-fred and Say-freed have all been said to her face, and every time she cringes. She cleared it up once and for all in a 2012 interview - it's Sigh-fred. Everyone knows it's Scor-say-zee, right? Wrong. It's Scor-sess-see. The director says so himself in the fifth series of Entourage. Last year Barbra Streisand made headlines after she complained to Apple boss Tim Cook about the way Siri says her name. How is that? Well, it's pretty much the way everyone pronounces it: Strei-zand. "She pronounces my name wrong," the singer told NPR. "Streisand with a soft S, like sand on the beach." So that's Strei-sand to you and me. Shia LaBeouf famously wore a paper bag on his head at the Berlin Film Festival in 2014, saying he wasn't famous anymore. But in talking about the incident, people were forced to say his name - which was a little tricky for some. He's Shy-a La-Buf, not Shee-ya La Boof. The South African actress has had a rough time getting people to say her surname right. It's not Ther-on or Ther-own (rhymes with Throne) - she goes by Ther-in. To make things even more confusing, that's not even her actual name either. In Afrikaans, it's pronounced Shar-leeze Thrawn, but she's opted for Ther-in as she thinks it's easier to say. Here she is telling Piers Morgan how to say it properly. Simpsons creator Matt Groening has one of those names whose spelling instantly flummoxes you. But it's not Groan-ing or Green-ing - it's Gray-ning. If you've merrily been living your life calling her Susan Sarun-dun you're wrong. The Oscar winner once helpfully explained to interviewers how to pronounce her name: "It's Sa-ran-don - rhymes with abandon." How do you pronounce 'Cheryl'?